As we have reported numerous times over the past several years, phthalates, the endocrine-disrupting chemical compound in plastics commonly present in food containers, medical products, cosmetics, and countless personal care and home products like vinyl flooring and shower curtains, have been linked to a host of human health concerns (1, 2, 3, 4, 5, 6, 7, 8, 9, 10) including fertility-related problems. Now a recent animal study supports the previous findings that phthalate chemicals may be responsible for the spike in fertility problems in humans. In the recent study researchers found that giving female mice oral doses of the phthalate DiNP for 10 days disrupted their estrus cycles, decreasing their ability to become pregnant for up to nine months afterward. To investigate these phthalates’ effects on female fertility, female mice were fed corn oil solutions containing environmentally relevant concentrations of DEHP or DiNP ranging from 20 micrograms to 200 milligrams per kilogram of body weight. Such doses are comparable to the levels of exposure that people may experience during their daily living and work activities. After the 10-day dosing period ended, the phthalate-treated female mice and their counterparts in the control group were paired with untreated male partners twice for breeding. At three months post-dosing, a third of the females that were treated with the lowest doses of DEHP and DiNP were unable to conceive after mating…there was a significant reduction in the number that became pregnant and produced pups… while 95 percent of the females in the control group became pregnant. The findings suggested that steroid hormone production and signaling were disrupted. At three months and nine months post-dosing, the DiNP-treated females’ estrous cycles differed from those of the control group. The proestrus stage, when the ovarian follicles grow rapidly and fertility increases, was shorter. However, the latter stages of the cycle, the metestrus and diestrus stages — during which the ovaries produce progesterone and the uterine lining forms — were longer. In examining the mice immediately after the 10-day dosing period, the researchers also found that the treated females’ uteruses weighed significantly less than those of the females in the control group. 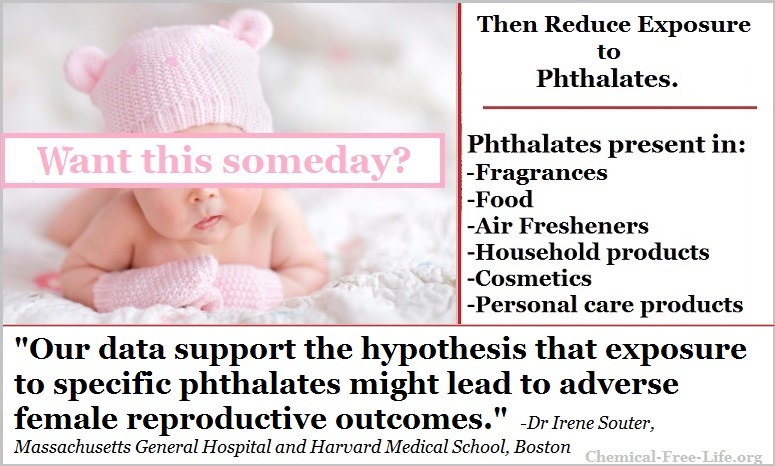 The current study’s findings linking phthalate chemicals with adversely affecting reproductive cycles supports previous studies that have reported that phthalate exposure in humans through cosmetics and personal care products can trigger early puberty in girls, reproductive aging, causing women to enter menopause several years early, preterm births and miscarriages.